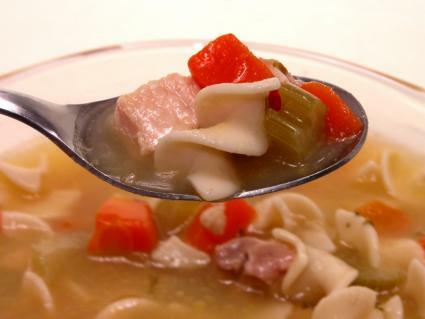 Filled with nutrients, Mediterranean Diet soup recipes are healthy, delicious and nutritious. Enjoy them served alone or add a serving of whole grains by enjoying a portion of crusty whole-grain bread. Soak the lentils for a few hours and throw away the water. Boil the lentils until they are half cooked (the cooking time depends on the size and type of lentil). Taste one to see if it is approximately half cooked. Sauté the diced onions (and carrots if desired) in the olive oil. Place the tomatoes, stock and (spinach and/or potato if desired) into the pot. Add cumin, salt and pepper. Add any additional seasonings desired. Simmer for approximately 30 to 40 minutes or until the lentils are tender. Add a dash of olive oil just before serving. Sauté the onion and garlic in the olive oil until soft. Add one quart water, the tomatoes, rosemary and pasta. Add salt and pepper to taste and cook for 15 minutes. Clean the mussels well and cut the fish into bite-sized pieces. Add to the soup and simmer for another 10 minutes. All of the mussel shells should be open at this point. Discard any unopened ones. Serve with crusty bread and olive oil. Add the onions to the oil and sauté for about 5 minutes. Add the celery and garlic and sauté until the onions turn a golden color. Add the 6 cups water, the lentils and spices. Heat until simmering and then cover the pot. Simmer until the lentils are tender, approximately 30 to 40 minutes. Add the tomatoes and chickpeas. Simmer for another 10 to 15 minutes over very low heat. Add the parsley or cilantro and season to taste with salt. Garnish each serving with 1 or 2 lemon slices. 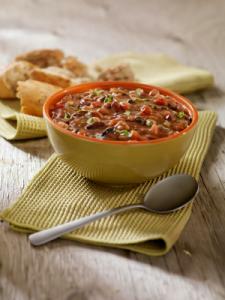 Packed with flavor, many Mediterranean Diet soup recipes are just as delicious served cold, warm or hot. Whether you follow an existing recipe or choose your own combinations of healthy food to create recipes of your own, the benefits of eating healthy will make you feel terrific.